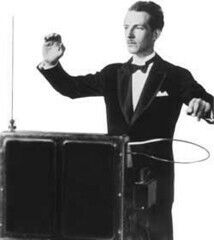 As a preview of a performance by Lev Theremin’s great niece Lydia Kavina this Saturday night in Katonah, New York, the NYT recounts the history of the amazing electronic instrument. As part of the Caramoor International Music Festival, Kavina will be the soloist in Joseph Schillinger’s First Airphonic Suite for Theremin and orchestra, completed 76 years ago. (Seen here, Caramoor co-founder and Theremin virtuoso Lucie Rosen. )” NYT article here. It struck me that what they talking about is that theremin from Boogiepop Phantom! I always thought that was some kind of Japanese instrument. Accordingly i regarded all that episode with theremin as a “romantic” digression without any physical grounds. How wrong i was! So Boogiepop actually does pretty believable thing when puts the theremin down the tunnel to give the “sleeping” children posibility to communicate with the world. If we can imagine physical phenomenon that allows children to abide in some passive electromagnetic state, why can’t we imagine that the only way for them to communicate with the conventional world is some kind of the electric interaction. So theremin as the “proximity sensor” is pretty suitable here.